Did you ever try to find a cat who didn’t want to be found? Today, as we prepared to take our cocker spaniel Leaf to dog park, we searched the house for Cuddles. 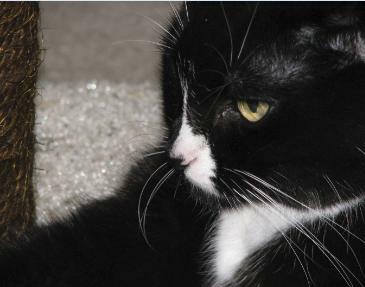 This little black-and-white tuxedo kitty has been our family member since 1993. We adopted her from our local animal shelter. Or rather, she adopted us. Instantly little Cuddles sprang from the rear of the big cage. She jumped over the backs of other kittens and landed in the palm of Linda’s hand. Cuddles went home with us. We never did find her. Finally we had to shut all the doors and hope she was somewhere upstairs where she could reach her water and kitty litter. Because high up on his perch in the living room, our cockatiel Sunshine was counting on us not to lock him in the living room with a cat. Although Cuddles doesn’t show much interest in our bird, we still wouldn’t want to take any chances of having natural instinct take over while we’re gone. Fortunately when we came home, Cuddles emerged from her hiding place. We have no idea where it is. No doubt she’ll use it again. No doubt, we’ll spend precious time searching for her again. What are your cat’s favorite hiding places? All right, you resolved that in 2012 you would write that book, article, or story about the most important animal in your life. Or you have figured out some terrific methods or products for training and getting along better with pets. Or you are a nature enthusiast who wants to write about the fascinating wildlife you have met. Or you have a point of view about animals that you feel compelled to write about and share with the world. Now is the time, gentle readers, to get serious. Take a look at our comprehensive new course for writing about pets and animals. We’ve poured over twenty years of professional experience into designing it. We want to see as many people as possible writing about pets, because this is how consciousness gets changed. The more everyone gets the message that animals are sentient beings and important (essential) parts of home and family life, the more animals get adopted, and the fewer are sent away to shelters. WOOF, MEOW, WRITE, PUBLISH will help you to start 2012 by writing whatever you always wanted to write about your beloved pet. Wouldn’t you like for someone, who has a lot of experience in fulfilling a dream of yours, to sit down and tell you what you need to do and know to duplicate that success? That’s exactly what we’re offering those of you who want to write about some of the most satisfying relationships in your life — the ones you have with animals. WOOF, MEOW, WRITE, PUBLISH: Writing about Pets and Animals for Love and Money is a new, downloadable, three-part, comprehensive course to guide you in writing books, articles, stories, blogs, and essays about animals for pleasure or extra income. We designed and wrote this one-of-a-kind course based on our experience as best-selling, award-winning authors of 14 pet books published in the United States, United Kingdom, Brazil, Italy, and Japan so far. Start keeping your New Year’s resolution today by going to http://www.allenandlindaanderson.com. Cats get labeled as jealous. It’s not clear why that particular flaw has been pinned on them. But we had a beautiful lesson from our cat Speedy when he showed us the meaning of true generosity. 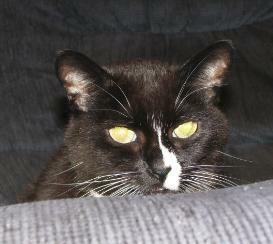 Speedy is a sweetheart but also an aging, overweight cat. We can relate. He rules the house and especially his much more agile and younger sister, Cuddles. We observe their relationship and marvel at how well Speedy makes Cuddles do what he wants. He is also patient when she pesters him to play with her. But this week, Speedy, a nice but firm gentleman, demonstrated that regardless of how he keeps her in line, he always has Cuddles’s best interests at heart. Speedy has taken over the top rung of the kitty condo in our living room. He loves that shelf by the window where he can curl up and sleep or look out at the world going by. This used to be Cuddles’s spot until Speedy decided to pull rank. This meant Cuddles had to sleep on the middle floor of the kitty condo. One evening Linda was petting and kissing Cuddles as they curled up together on the couch. Speedy watched intently. Linda was surprised to hear the distinct sound of Speedy’s loud purr. As he watched his little sister being loved, it brought him such pleasure that he purred his satisfaction. We talked about the incident of Speedy purring while Cuddles received affection and wondered how many people would derive so much joy from another’s good fortune. Oh, the things we can learn from cats! Now Speedy spends more time lounging on the back of the couch. He purrs and licks Allen’s head and his cheeks. Both seem to be enjoying their time together. Visit www.facebook.com/album.php?aid=185899&id=711934289&l=0dbed09efb to see photos of Speedy and Cuddles. By the way, we just ended Week 3 of our book launch for DOGS AND THE WOMEN WHO LOVE THEM. It was a wonderful experience to meet all the dog lovers. But we had a special treat at Valley Booksellers, a super independent bookstore in Stillwater, Minnesota. Five dogs showed up for the event. Linda had the pleasure of reading to them about how special dogs are. Visit www.youtube.com/watch?v=WUVa0vxQFuw to view a video of the reading. Has a cat let you know of danger? I got Tuffy when she was about two months old but only weighed twelve ounces. Her mother had been hit by a car, and my friend found her outside his bedroom window, yelling her head off. She couldn’t hold her head up so she was bottle-fed and learned how to use the litter box. She is small and compact but really has a temper, especially if there is stray cat walking across her yard or down the walkway. On July 13th, 2010, some teens broke into my apartment while I was asleep. Tuffy was voicing her displeasure. I thought it was just another stray cat, even when I heard noises in the living room. I just thought the cats were bumping against the window. Then Tuffy’s cries took a new tone. When I went to get out of bed, an intruder confronted me in my bedroom. I yelled, and he ran off. Tuffy was still snarling and crying from under the stove. Now I will listen to her more closely when she goes on a little rampage. 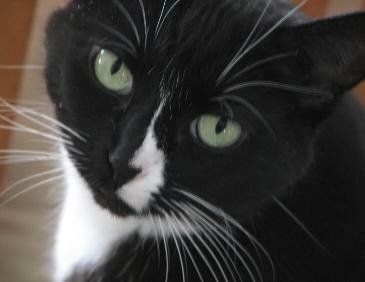 Tuffy has two older brothers, Apache and Blackfoot, whom she adores. Tuffy is my little hero. Visit www.angelanimals.net/nlimage40.html to see photos of HERO Tuffy, Apache, and Blackfoot. When have you upset the natural order established by the pets in your home? On New Years Day morning, we were relaxing in our living room when Allen noticed that Speedy was not at the top of the cat tree. Our carpeted cat tree is situated so that both Cuddles and Speedy can look out the window at the front yard to see all the birds, squirrels, and people. Allen did not realize that the cats have a routine in regard to their cat tree. So he went to find Speedy, carried him to the living room, and placed him on the top seat. Speedy settled in, looking a little confused. Cuddles and Linda watched as Allen did what he thought was a nice thing for Speedy. After Speedy was in place, Cuddles immediately jumped up and tried to get onto the top perch. Speedy wouldn’t let her. After about five minutes, Cuddles was still thinking about this situation as she sat on the second highest perch. Meanwhile, Speedy tried to jump down from the top by using the second perch as a stepladder to the floor. Cuddles would not budge, making it impossible for Speedy to get off the cat tree. Allen decided to fix the cat chaos that he had inadvertently created. He placed Speedy carefully on the floor and then returned Cuddles to her usual morning place on the top perch. The natural order had once again been changed, not by request, but by an outside busy body. As if to make their point that Allen’s human interference had not been welcomed, Speedy quickly left the room. Cuddles jumped down from the cat tree and followed him out, leaving both perches unoccupied. There is a spiritual principle known as the Law of Noninterference. Essentially it means that sometimes, things need to happen the way they are set into motion and with silent agreements in place between the people or animals who are directly involved. What are favorite animal books you are reading now? Being authors of animal books, we are always fascinated by what others are writing on the subject. Below are some of the books we are reading and enjoying. Perhaps they will find their way to your bookshelf too. Getting to know farm animals in such an intimate way as they are presented in this book offers a perfect opportunity to love them as individuals. One of our favorite stories is “Hope and Johnny: Loyal and Loving.” It’s about two pigs from Farm Sanctuary in Orland, California. They were such loyal friends that when Hope’s leg was injured and she could no longer walk, Johnny kept other pigs from bothering her when she ate. Johnny stayed by Hope’s side day and night. After Hope died of old age, Johnny, although younger and healthier, died several weeks later, presumably of a broken heart. Because of all the time and effort we put into writing our award-winning book RESCUED: Saving Animals from Disaster, we are always interested in good books about animal rescue. MOORE TAILS: Rescuing Mutts in the South: An Intimate Portrait of Animal Rescue & Cruelty by Maureen Burke-Horansky (2009, Ink Stain Publishing Corp., $15.00, 286 pages, color photos, authormaggie@pinehurst.net) is a unique entry in this genre. This book shares the true story of five passionate women who managed to get a local North Carolina county animal facility to allow adoptions. The women fight animal cruelty and attempt to lower the kill rate in the facility. They are creative, courageous, and persistent. Another animal rescue book that caught our attention is GREYHOUND TALES: True Stories of Rescue, Compassion, & Love, ed. By Nora Star, Inception by Kari Mastrocola, Introduction by Susan Netboy (1997, Lost Coast Press, Order: Nora Star, 9728 Tenaya Way, Kelseyville, CA 95451 or http://www.cypresshouse.com, $15.95, 116 pages, color photos). This anthology of stories from wonderful people who rescue and adopt greyhounds offers insight into the once multi-billion-dollar greyhound racing industry and its tragic consequences for the six-thousand-year-old greyhound breed. It includes information on how to determine if adopting a greyhound is right for you and how to join the National Greyhound Adoption Network and subscribe to the GREYHOUND NETWORK NEWS quarterly newsletter.